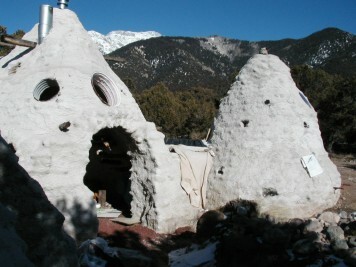 These are the two connected earthbag/papercrete domes. I was given the opportunity to help demolish an earthbag house project that had been started in our community. The owner/builder had sold the property and the new owner wanted the land cleared. At first the owner wanted to have heavy excavation equipment come in and just push it all over and haul the debris away. I offered to help carefully take the structure apart so we could recycle some of the materials and learn something about how easy it might be to tear down such construction. There were three domes to be removed, two of them connected and the third freestanding. 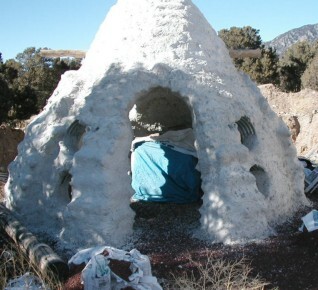 These domes were constructed similarly to my house: polypropylene earthbags were filled with crushed volcanic rock (scoria); the courses of bags had barbed wire between them and the bags were tied to each other with poly baling twine. 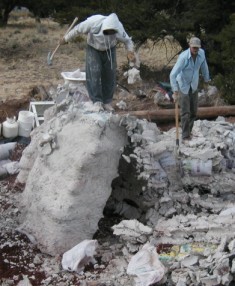 Papercrete was applied to both the interior and exterior surfaces. Additionally, rebar stakes had been driven through several courses of bags in many locations. This is the freestanding dome, before demolition. The freestanding dome was a rather lacy affair, almost a gazebo, with four arched openings and several circular windows. 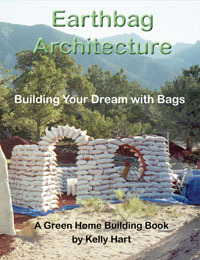 The builder had experienced difficulty in erecting this delicate building (it had collapsed several times in the process), so at my suggestion he had wrapped the columns between the arches with two-inch chicken wire mesh before applying the papercrete, in order to stiffen the building and make it stronger. This gazebo-like dome was built on a layer of about ten inches of scoria, which I started to collect for reuse. As I was digging around the base of the structure, it occurred to me that an interesting experiment would be to dig out from under a section of the wall and see how much could be undercut before the wall began to collapse. The section of wall I chose to undermine was about 15 feet long, between two arched openings. I dug alternately from one side and then the other, completely removing the scoria from underneath the wall. Like my house, there was no other foundation to this building. The foundation of this 15' section of earthbag/papercrete wall was almost completely undermined, and the wall is still completely intact! After I had cleared about a yard in from both sides, with nothing happening to the building, I was rather surprised. After all, this is just bags of rock stacked on top of each other, amounting to an estimated four tons of material. There were no cracks in the plaster nor sagging of the wall. I dashed home to get a camera to record the events, and continued undermining the wall, being careful to keep out of harm's way if it should suddenly collapse. The more I dug the more amazed I became. When the wall section was precariously balanced on about one foot of scoria in the middle of the wall, and nothing had happened except one bag had fallen out onto the ground below, I snapped the picture that can be seen here. This is the same section of wall after much banging with an axe and hammer. If anyone had any doubts about the strength and integrity of this system of building, this experiment should allay those concerns. Earthbag building of this sort can be STRONG! Eventually, as I continued to dig out from under the wall, it simply began to hinge downward from a point about ten feet up, above the arches. The wall itself showed no signs of falling apart. In fact when the owner tried to break it apart with an axe and a sledge hammer, he finally gave up and decided to have the backhoe tear into it! 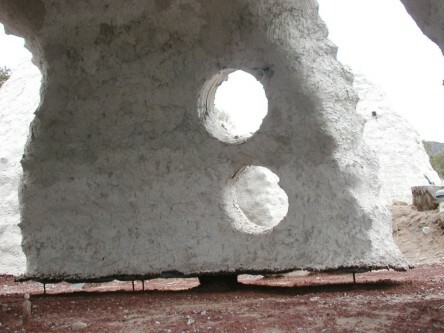 The fact that it was surrounded with the wire mesh and that he had used twice the amount of Portland cement as usual in the papercrete mix are factors contributing to the phenomenal strength.